Click here for information and nominations. Walk-Trot with Me Class: (Juniors and Adults): Handler dog teams will be asked to move at different paces. The class will include circle lefts, circle rights, about turns, stop and sit, stop and down. The Juniors Class is for handlers 11 and younger. Jumpers Class: On leach, dogs will compete in an obstacle course that includes tunnels, cones with distractions such as balls, toys and treats, broad and high jumps. Handler can either go over or around the jump while the dog jumps. This will be a timed event with classes divided based on dog height which will determine jump height. Handler must be 12 or older. Tricks Class: The number of tricks entries is limited. Entrants will be chosen prior to the show based on a short, no longer than 1 minute video. The Lead Line Class – Costume Parade: Dress your dog like your favorite part of Devon – a Pony, the Ferris wheel or a French Fry. 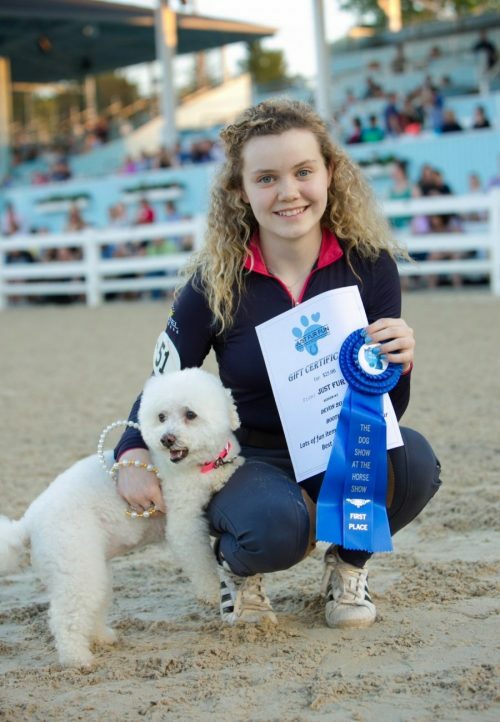 Handlers of all ages welcome – Ribbons for all entrants. All dogs must be leashed at all times – classes will all be held on-leash. Ring attendants and/or judges may excuse a dog for any reason including undue stress. A crating area will be designated. Please bring your own crate.